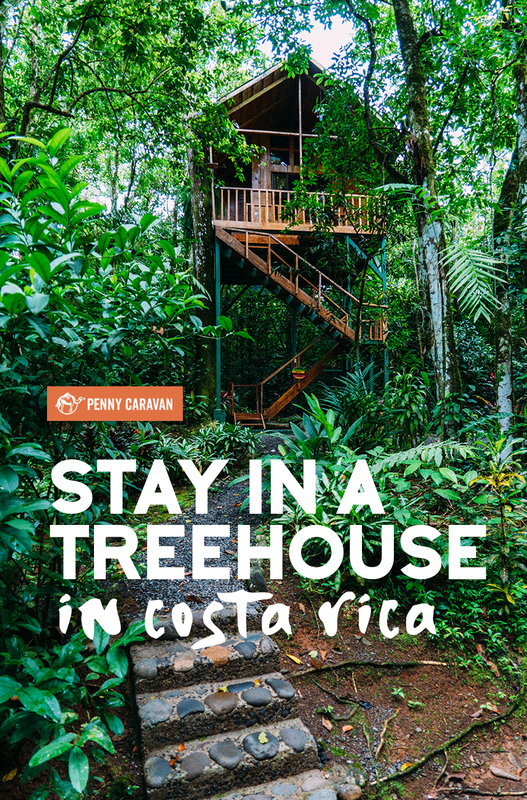 When trying to decide where to visit for one week in Costa Rica, I had to come up with a priority list of what I really wanted to do and see—and number one on my list was to sleep in a treehouse. 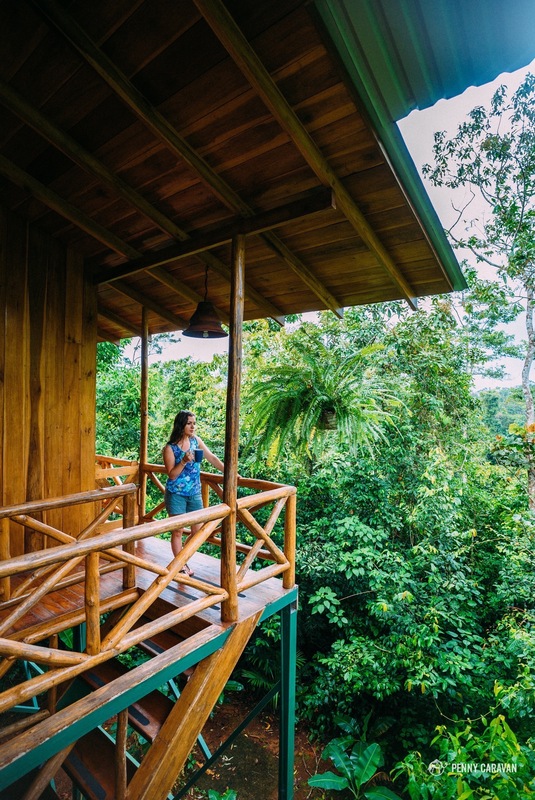 Now there are plenty of treehouses in Costa Rica, from airbnb rentals to exuberantly priced resorts and even a treehouse village community. 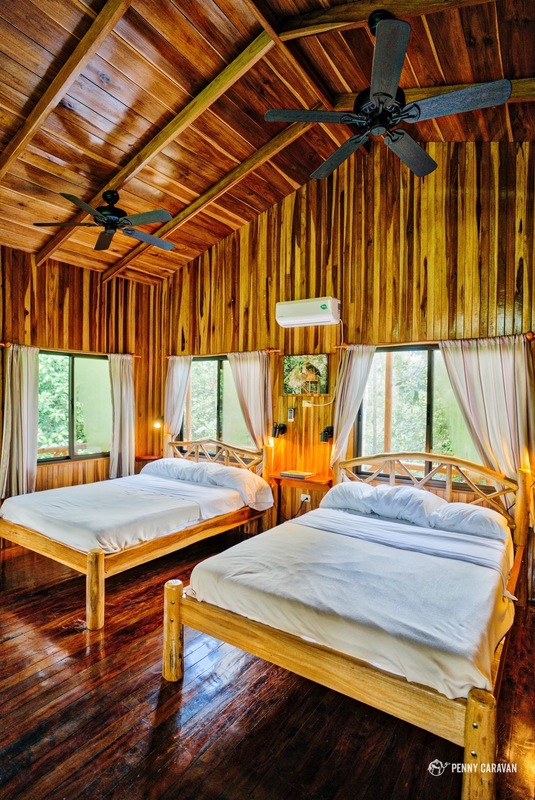 Price, comfort level, and location led us to choosing the Tree Houses Hotel, about a 45 minute drive from Arenal National Park. Enjoying my coffee on the balcony of our treehouse. Rooms: The houses aren’t actually built into the trees, but are built on stilts among the trees. I thought I would be disappointed by that, but everything else about the hotel more than made up for it. We stayed in the “Agouti” house which is located near the back of the property and therefore very quiet and private. The house was huge with high ceilings and lots of windows with screens so you could open them to enjoy the sounds of nature. 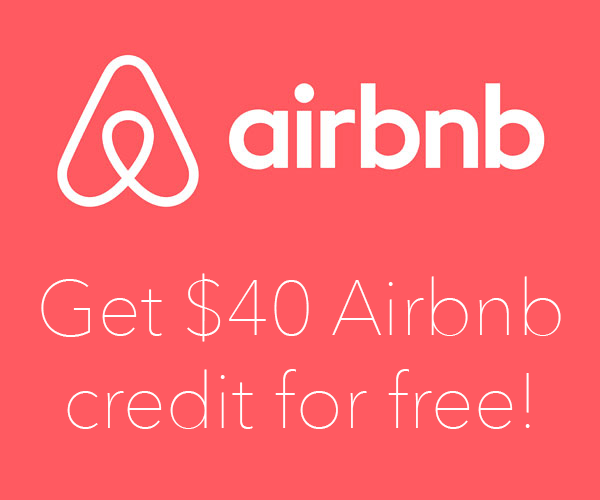 You could also close them to enjoy the air conditioning! It had a large wrap around porch with rocking chairs where we spent an entire afternoon with a couple Imperials (the national beer), just watching the animals. 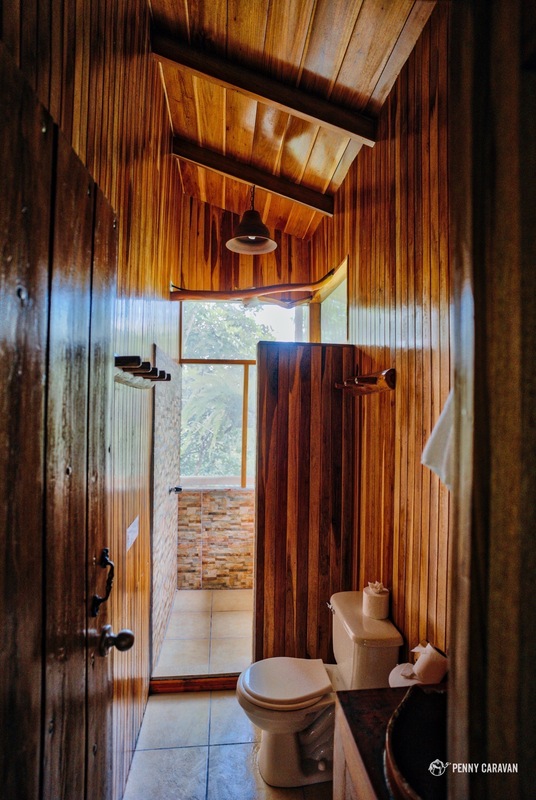 It has a fully functioning bathroom with the coolest shower I have ever had the pleasure of using—it has screens on two sides that open to the jungle! Our room had lots of windows. The shower opens to the jungle! Hotel Property: There are two senderos, nature trails, on the property. 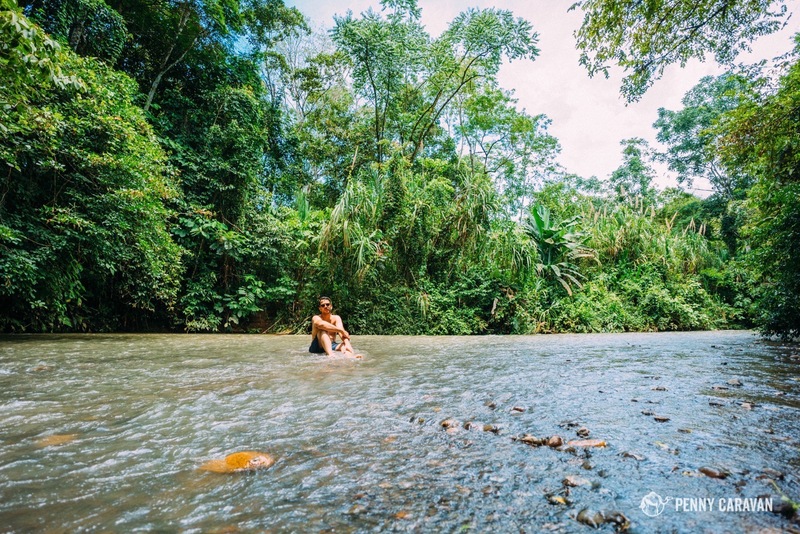 One of them leads to a waterfall with three small pools in which you can swim, and then on to the river where you can also swim! The trail was about a kilometer, but it took us a while because we kept seeing so many animals: toucans, woodpeckers, hummingbirds, squirrels, and howler monkeys! 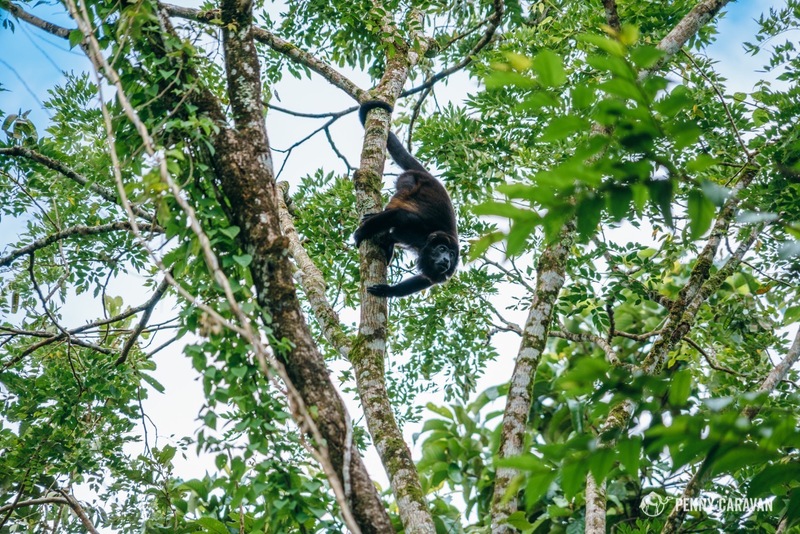 You don’t have to go for a walk to see them, though—we spent a good hour photographing the family of howler monkeys swinging around right off our porch who woke us up with their bark-like growling at 5:30am! Walking down the nature trail. The waterfall has three pools for swimming which are regularly cleaned. So many gorgeous plants and flowers on the property! 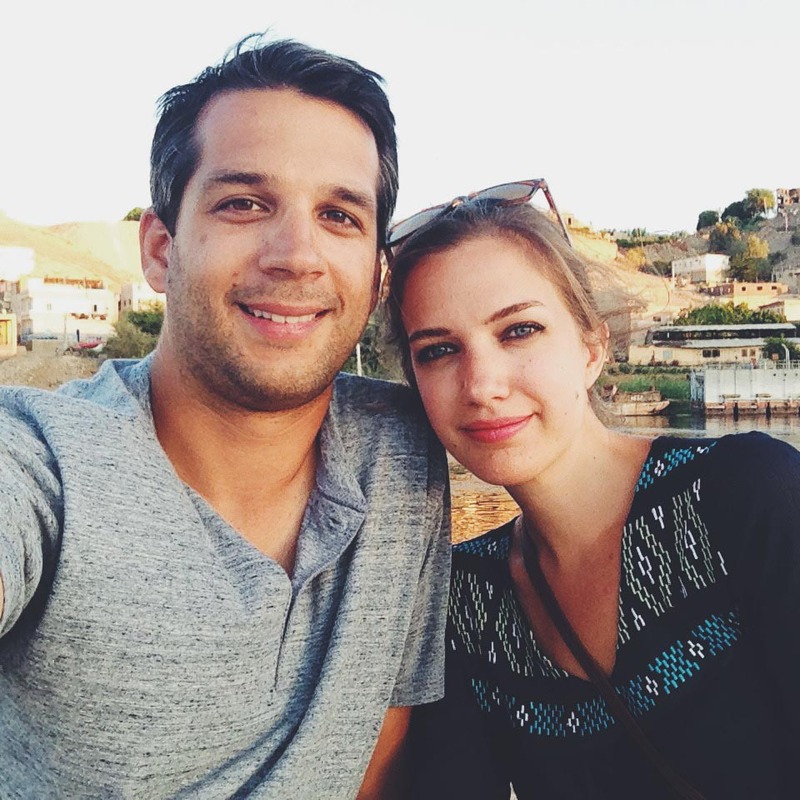 Staff: Mark and Lucy live on the property and they are absolutely fabulous hosts who made an effort to get to know each guest to make sure they were all having the best possible experience. They have lots of tours and activities they can plan for you (check the website here), and they were super helpful with directions and suggestions for those of us doing our own thing. Breakfasts are included, and they were the tastiest of our entire trip. Before that, though, coffee is delivered early in the morning in a thermos right to your porch so it’s ready as soon as you wake up. 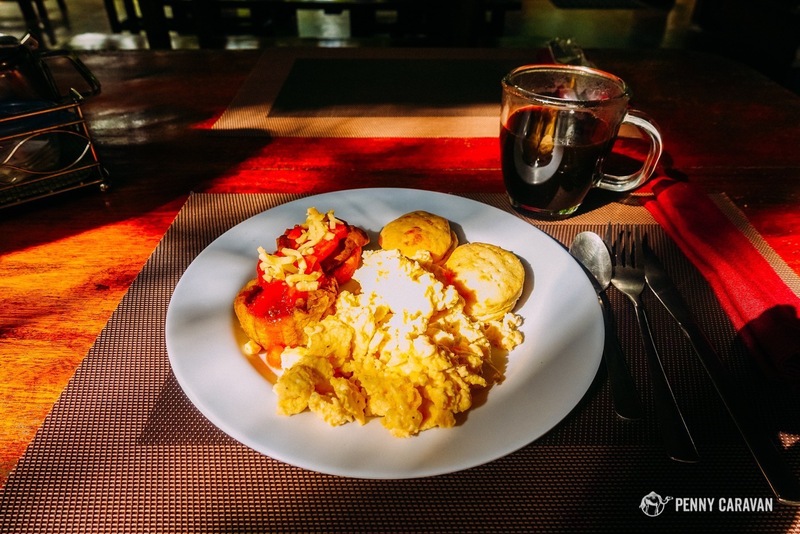 Yep, as soon as the beautiful sounds of nature wake you, you can walk right out onto your porch and take your time waking up with a full cup of perfectly brewed Costa Rican coffee. Heaven. 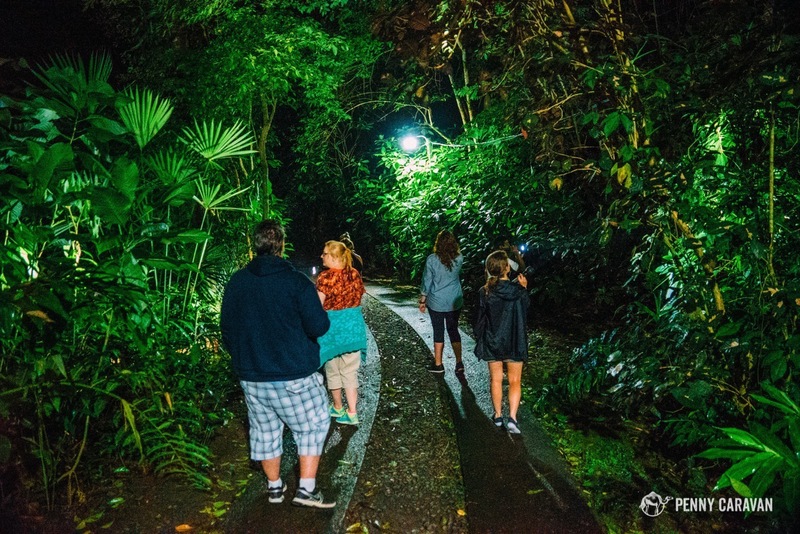 At 8 pm every night, Rolando, one of the night watchmen, will guide guests on a night hike down the sendero to spot animals. We saw a sloth, tarantula, opossum, motmot bird, and lots of different kinds of frogs including the famous red-eyed tree frog. 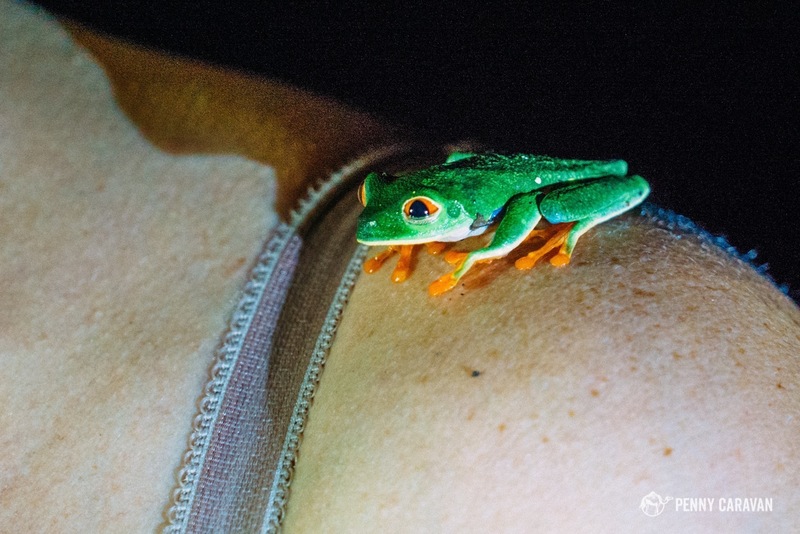 It was unbelievable how he could find the tiniest of frogs in the middle of the night, and we were equally amazed that the hotel offered this free guided tour as part of our stay (tips are appreciated). On a night hike with Rolando! The red eyed tree frog. 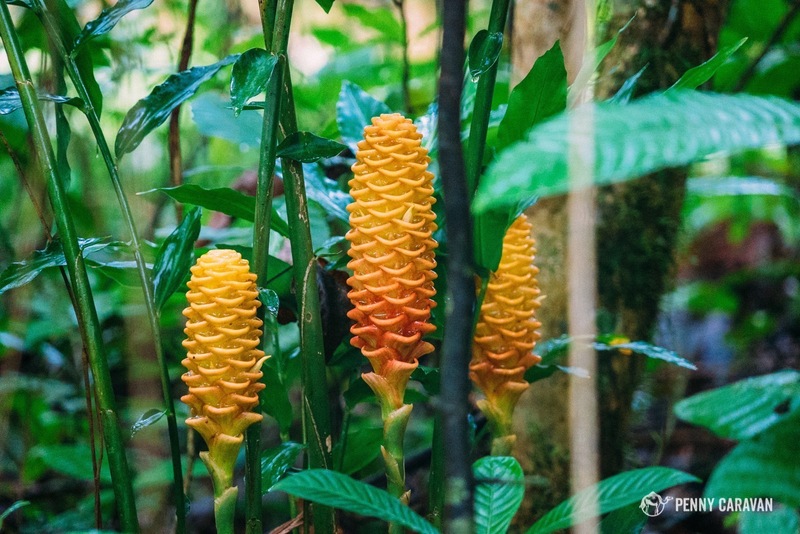 Location: The hotel is located near the small town of Santa Clara, about an hour’s drive northwest of San Jose and 45 minutes southeast of La Fortuna and Arenal National Park. You could easily day trip from the hotel to the National Park, hot springs, zip lining adventures, and everything else La Fortuna has to offer. Santa Clara didn’t have a whole lot to do, but did have a few grocery stores and restaurants. We enjoyed “Happyland” and “Tilapia’s” on the recommendation of our hosts. There’s also a big futbol field which would make for a fun evening if there were a game going on! 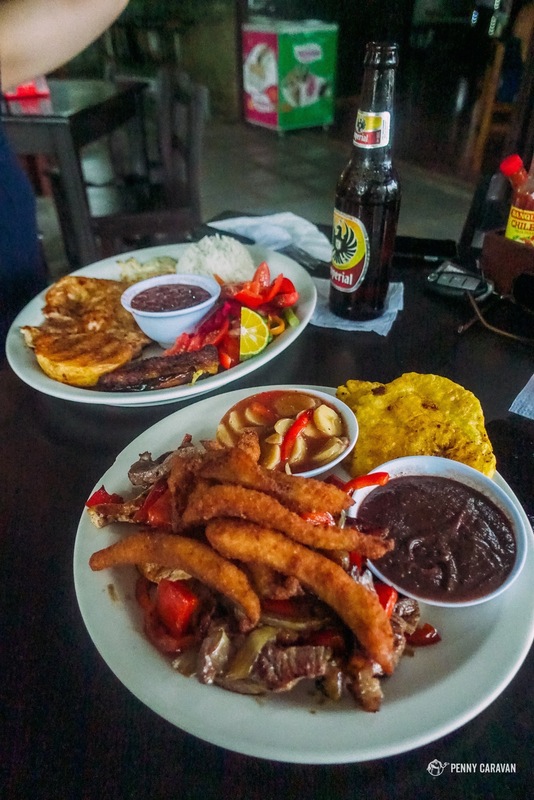 Casado Tipico and Mixed Grill plates at Happyland. 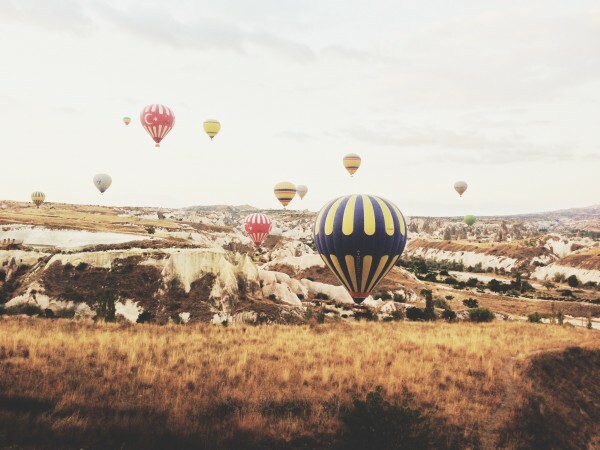 In Conclusion: The Tree Houses Hotel is ideal for families with young children, but the houses are secluded enough that it was also quite a romantic place for a couple. We feel so lucky to have seen all of the animals that we hoped to see in Costa Rica right here on this property, on our very first day! 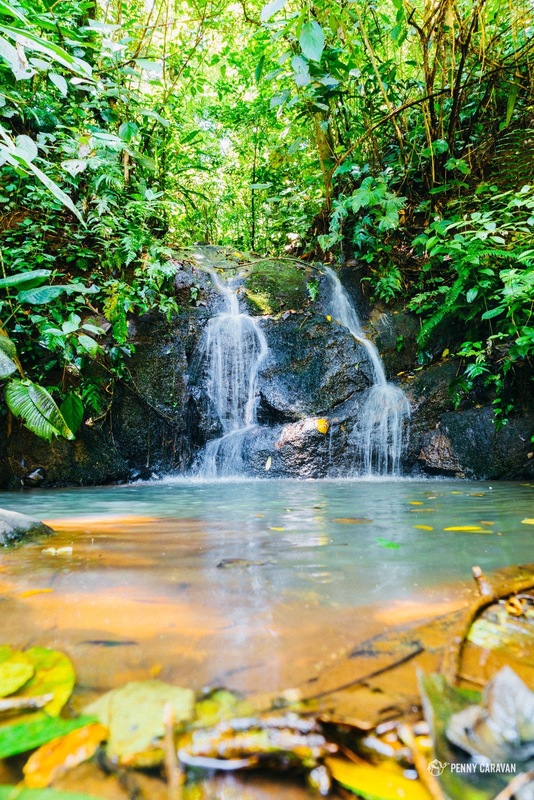 We would definitely recommend a stay here because it’s got all the makings for that famous Costa Rican pura vida experience—relaxation while fully immersed in the rainforest! 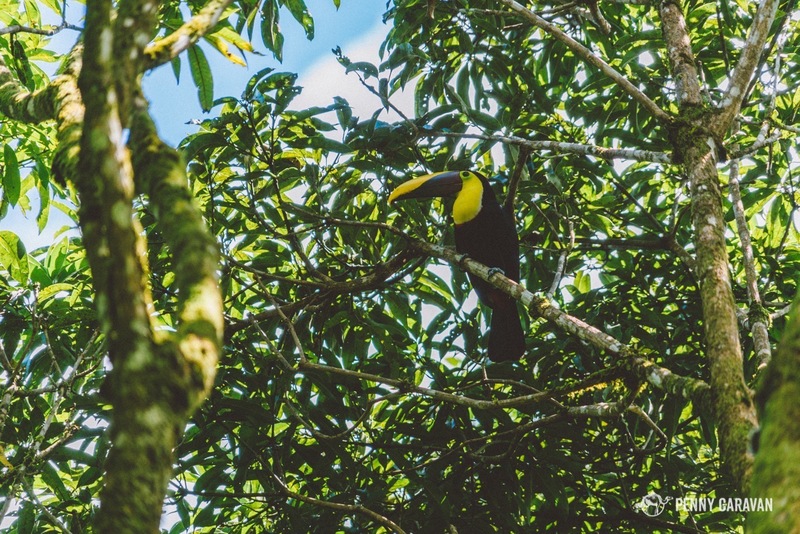 Ready to start planning your own Costa Rican adventure? 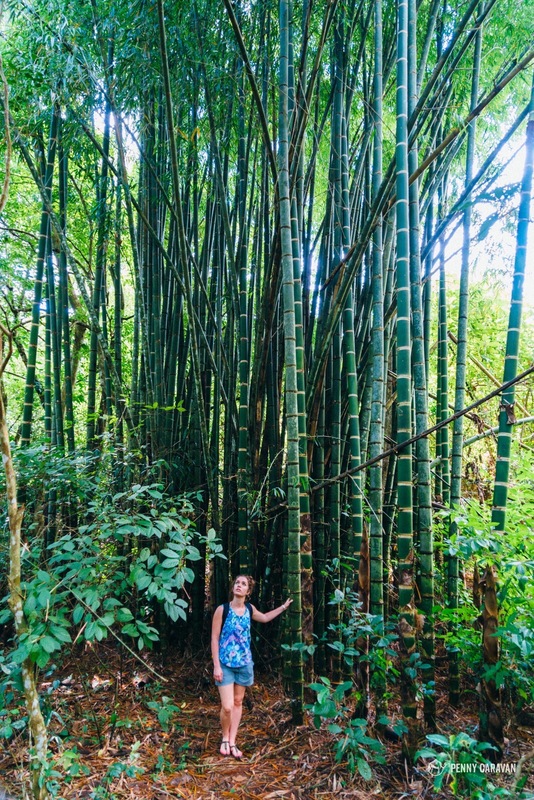 Get started with our One Week Costa Rica Itinerary.